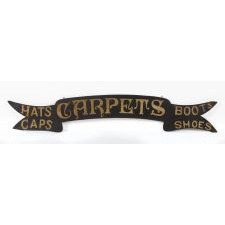 Painted surface doesn't get any better than what is present on this wonderful early trade sign that announces "Carpets," in embellished, whimsical letters, flanked by "Hats" and "Caps" to one side, "Boots" and "Shoes" on the other in a block style with some interesting attributes. 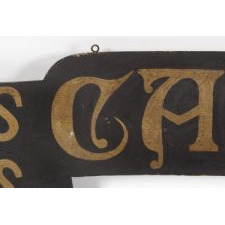 The background is black, faded to a very dark brown, and the lettering is gold, which seems to be hand-mixed. The color is ochre yellow/tan to which some metallic content was added and over which an amber shellac or varnish was applied that aids in the overall effect. The varnish covers the entire face and contributes to the exceptional early surface, which results from craqelure of both the paint and varnish. On a scale of 1 -10 I'd weigh it in at a sold 10 or above. 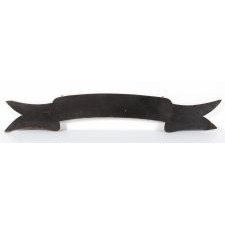 The profile of the half-inch wooden plank is scalloped into an arched swag ribbon, like a billowing streamer, terminating in forked swallow tails. 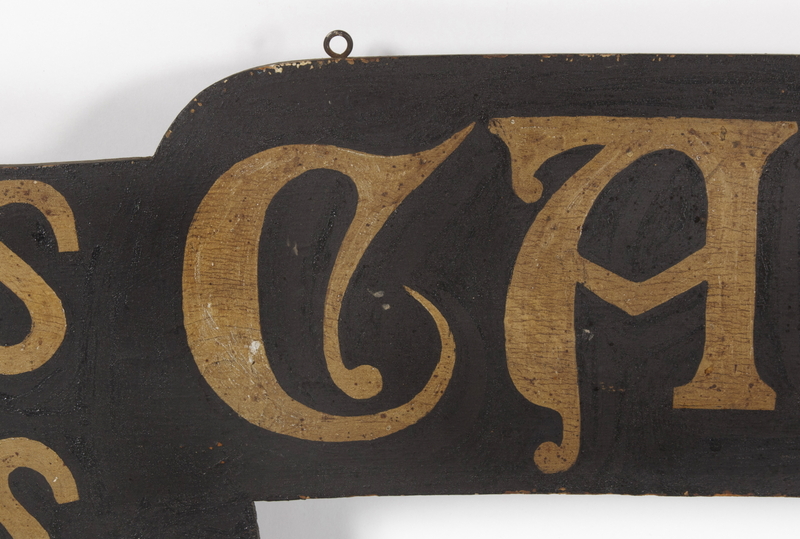 The unusual design contributes significantly to the visual impact of this great piece of American folk art, made ca 1850-60. Condition: There is some loss on the lower two swallow tails, but these are old and are not a point of focus when the sign is viewed in person. The presentation is fantastic.